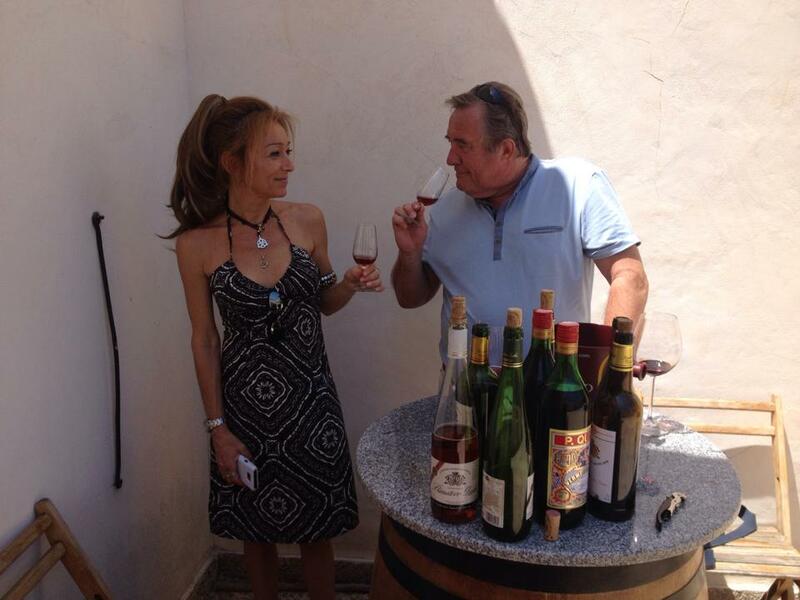 A Visit to Bodega Primitivo Quiles….Alicante´s Wine Story Starts Here! 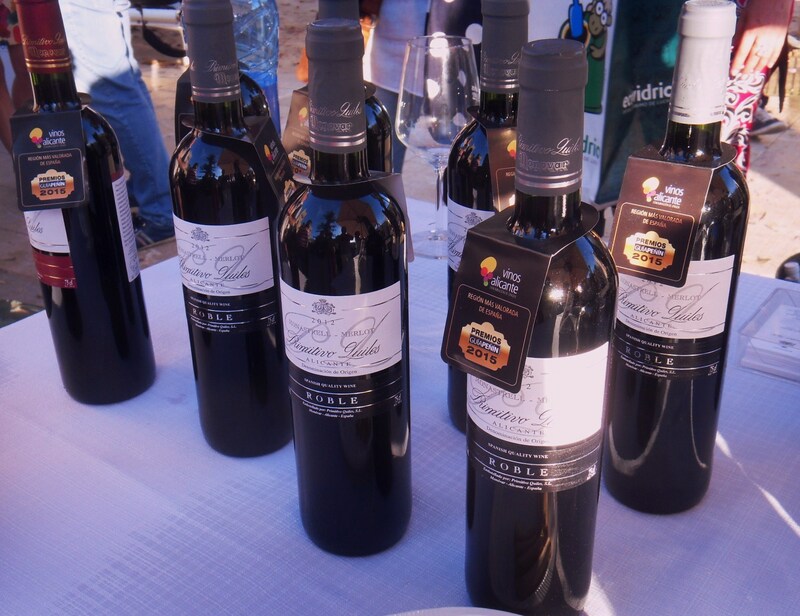 Alicante´s oldest bodega, Primitivo Quiles, is to be found in the village of Monóvar. The family which owns it started their relationship with wine in 1780. 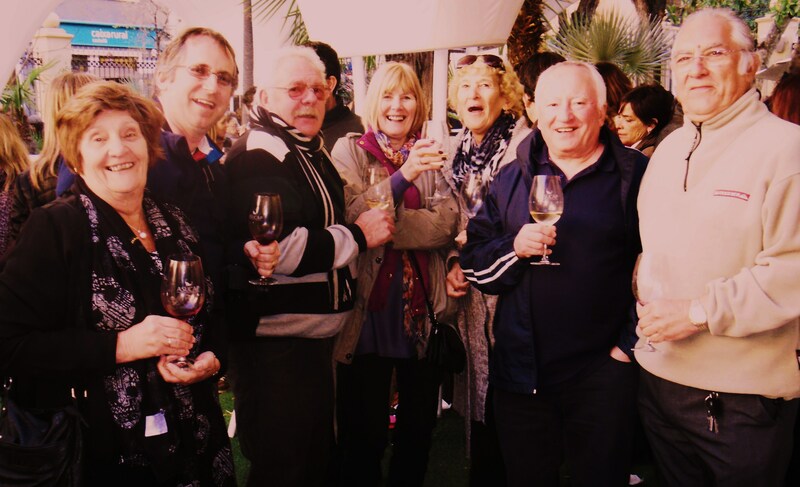 Historically of course Alicante´s wine making traditions go back much, much further, some 2000+ years to the Iberian period, as is the case with much of the Valencian Community. However whilst the tradition may be long as with much else in life it has been subject to devastating events. Pre-phylloxera wines from Alicante were exported in bulk, but the most famous of them , Fondillon, went to the tables of royalty and the upper classes. There is no shortage of historical proof for this. Elizabeth 1st of England `loved Alacant wine above all others´, her successor James 1st described his urine as being as `red as Alicante wine´ and Louis the 14th approaching the end of his life after a long illness called for Fondillon with sponge cakes. There is no evidence that pre-phylloxera, Alicante produced just Fondillon wines. It is more likely that wine-making was a community affair with wines being transported to Alicante for Export. When Phylloxera hit France wines from Alicante, as well as Requena and Castellon were all exported to Bordeaux to help bulk up the wines of the region. But this did mean that old, aged wines were not produced to the same level that they had been. When phylloxera finally arrived in Alicante the bodegas were not capable of reacting fast enough and wine-making almost died out. Exports from Alicante fell by half in a single year. Fast forward a little, and with phylloxera gone, thought was being given to replanting the vineyards. However the Industrial revolution in Spain arrived, somewhat later than other parts of Europe, and those who might have worked in the vineyards or indeed owned them were tempted instead by the textile industry which was opening up nearby. Primitivo Quiles played a big part in the revival and production of this legendary wine and wine growing as a whole! Despite the bad state of the economy Primitivo Quiles carried on with their traditional winemaking, even managing to preserve Fondillon throughout the whole period. In 1951 another Primitivo Quiles, this time the grandson joined the family consolidating production and setting the bodega on its course to the modern-day. By the 1970´s this had led to the introduction of new wines, expanding the range. The family originated in the hamlet of Raspay, near to El Pinoso where the family vineyards were. Today those vineyards are still used to produce the wines from the bodega although they have changed hands many times with death and inheritance. Rosado, Raspay, Blanco Caña and Tinto Cono. Monovar was chosen for the location of the bodega because it is near to the railway network which made transport so much easier. The vineyards are mainly old plots of Monastrell, up to 80 years old which produce low yields but high quality grapes. Monastrell traditionally is believed to have been imported to Castellon first ( Camp de Morvedre) from Greece and in France is known as Mourvedre. The wines are bright red, capable of long ageing which of course makes them ideal for Fondillon. Fondillon is a rancio style of wine. The naturally fermented wines from over-ripe grapes are placed in large oak barrels where they are typically aged for a minimum of 10 years but usually much, much longer. Unlike Port and sherry which are fortified, no raw alcohol is added to the wine which reaches 16+% ABV naturally. Over time, the wine oxidises becoming rich and complex, and of course changing colour. The wines can be subjected to a solera system but at Primitivo Quiles wines from different vintages are blended with the barrels being refilled and left to age peacefully. 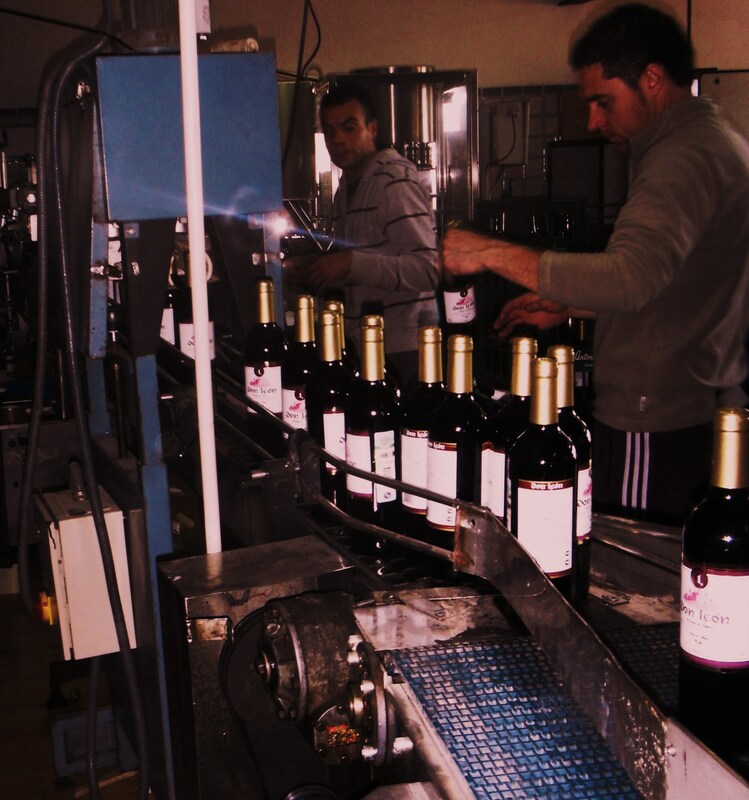 The smallest amount of wine necessary is drawn each time a bottling takes place. The bodega still possesses two of the original barrels from 1892 but only one now has Fondillon in it. The other was filled with Moscatel in a year when there was insufficient wine to fill two barricas with Monastrell, thus starting the Gran Imperial wine we were to taste later. The old bodega is difficult to navigate and the day we visited wines were being pumped through long pipes. We were very lucky therefore to be given such a definitive and comprehensive tour! Emerging into the sunlight and the terrace we were about to be given an equally impressive tasting of the bodega´s products. First up was Blanco Caña 2014, a white from 100% Airen at 12%ABV. Pale yellow, very clean and bright with golden flashes, it was typical of the variety in that the nose is not very expressive, maybe a little citrus. In the mouth that converts to fresh grapefruit juice acidity, a very nice fresh, easy drinking white wine! The 100% Monastrell Rosado Virgen 2014 is very popular in the United States. A fresh and bright strawberry pink with long legs this wine shows no move towards the fashion for French style pale wines! On the nose it is lightly floral with a hint of wild fennel. In the mouth it is very fresh, light , with good acidity to balance the fruit and a good, long finish. An excellent summer wine! ( 12.5%ABV) The Tinto Cono Nº 4 is also 100% Monastrell at 14.5%ABV. This time a red wine, it takes its name from the deposit in which the best barrels of Monastrell are blended. A nice fresh medium bodied wine it is cherry/ruby red with glycerinous long legs. On the nose it is a very traditional fresh Alicante style with morello cherry fruit. In the mouth it is initially smooth on entry with a hint of astringency but a long satisfying finish. The 2008 Raspay Reserva at 14%ABV has spent two years in old oak barrels. It has a distinctive red and yellow ribbon which replaced a blue and white one after a visit to Alicante from the then King in 1977 who reportedly liked the wine very much. A medium bodied garnet colour, reflecting the ageing process, it too has long glycerinous legs. On the nose you note the oak ageing and tobacco leaf. In the mouth it is dry, but full , complex balsamic notes mixing with tobacco flavours and a long satisfying finish A wine to accompany good, rich food. Next we moved to the bodega´s more specialist products. We started with the Gran Reserva Fondillon 1948 at 16% ABV. This was drawn in 2000 and comes from a run of just 3000 bottles. Tawny in colour with a bright orange edge, it has long slow legs. On the nose it is rich and complex, raisins, nuts, toasty nuances with figs and honey. In the mouth, satisfying, complex, rich, smooth and complex it is an aperitif worthy of a good meal afterwards! The Moscatel Extra Vino de Licor at 15% is not a normal golden mistela. This is a nutty brown colour, with a tawny edge and gold flashes reflecting its barrel ageing. On the nose rich, ripe peach and apricot overlaid with caramel. In the mouth it is deep, complex, raisins, rich …quite fabulous! The Bodega´s Vermut has been made for years, it is a style of aperitif very much back in favour in Spain currently. Deep tawny in colour, with long legs, it is fresh on the nose, with bitter herbs but in the mouth was fresh and almost slightly sweet. Finally we tried the 2003 Gran Imperial Moscatel, a vino generoso. This was drawn in 2013 and is from a run of just 182 bottles! A deep dark dense brown, almost liquorice in colour, it has old toffee and tobacco leaf in a complex rich nose. This is matched in the mouth! Intense, a completely different style of wine… a few drops on vanilla ice-cream would be perfect! This was a fascinating and highly educational visit by VÍ vid to a historic bodega carrying on a much longer historical tradition with wines of the highest quality. It also reflects the regional variety which makes wines from Alicante worth investigating and tasting against their cousins from the other provinces of Valencia. A truly unforgettable visit! 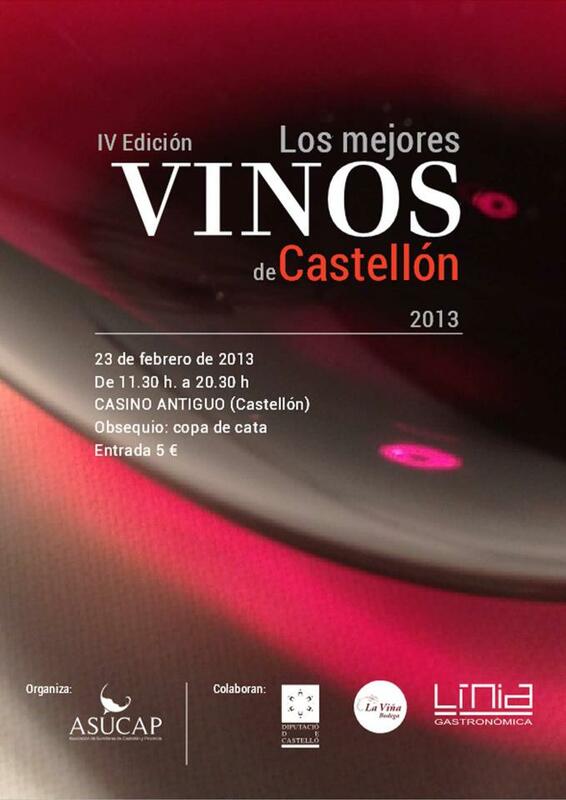 Wine is Still Alive and Kicking in Castellon! ASUCAP 2013. 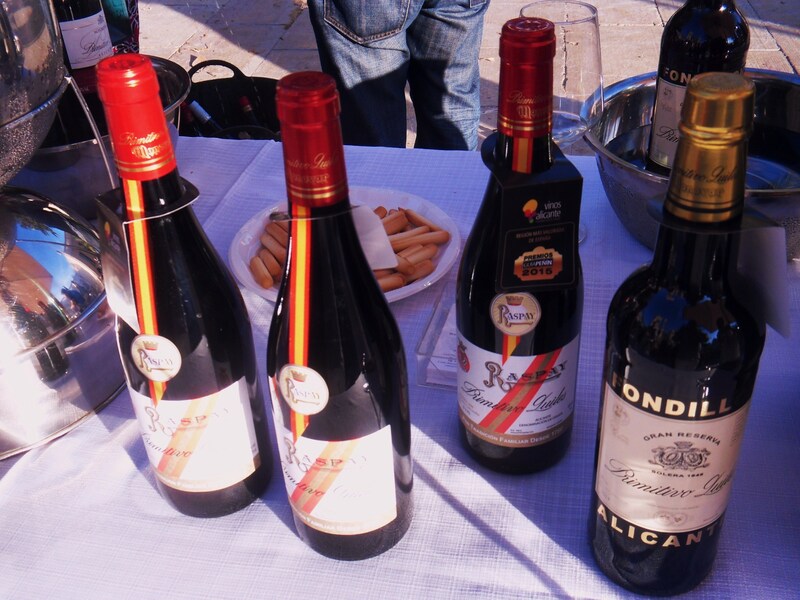 Yesterday was the fourth `Best Wines of Castellon Fair´ held once again in the gardens of the Old Casino right in the heart of the City. Superbly laid on again by ASUCAP, the province´s Sumilleres organisation, the sun shone on a very succesful event. Now firmly fixed in the Vilamarxant Wine Club´s diary and looked forward to as much as any other wine fair, eight of us took to the road this time. The fair is still small enough to be a very friendly affair, but this should not be considered so at the expense of progress in the region. Far from it, club members have grown up with these bodegas as they have emerged, know the owners, have visited several and regularly buy wines from favourite growers. They enjoy the trip each year to try new wines, hear of developments, see how progress on a particular project is moving or to find a new bodega has opened up. Some of the Vilamarxant Wine Club. This year gave no reason for disappoint either. There was one new bodega with excellent mono-varietals to enjoy, one bodega with a new white wine and some sassy new labels as well a wine designed for the forthcoming Fiesta of the Magdalena and of course there is the news that a small group of growers from the Benicarlo area are to revive Vino Carlon, a fabled red from Garnacha Tintorera. More of all these later. First spot always goes to new bodegas and a look at their wines. Bodegues Besalduch and Valls was created in 2007 in nearby Sant Mateu, Capital of the Maeztrazgo, some 30km up the CV10 from Benlloch. Since then, and with some replanting, they have been working on a range of oils and wines to revive a local tradition. Yesterday they were showing the five mono-varietals from their Grand masters range. Under the assesorship of José Luis Sanchez this recently released range shows good varietal characteristics in what initially appears a traditionally labelled bottles but which I think rather better mirrored the Great Masters robes! First wine is a Sauvignon Blanc, Llanson de Romani. Pale lemon, , clean and bright with tropical fruits, gooseberries , fresh and lively on the nose. In the mouth crisp dry with a mineral dry finish but balanced with lovely fruit, quite full in the mouth. This was a very popular starter! The Syrah Francesc de Sanz, had a typical cherry red colour with good legs. On the nose it was full of cherry and smoke with liquorice, quite spiky! In the mouth a nice burst of fruit, followed by jam, good long finish. Liked this too. Third wine was the Cabernet Sauvignon, Arnald de Soler. This was lighter red in colour and for me still quite closed on the nose, the only real hint being vanilla. In the mouth the wine was lean, Cabernet fruit with green peppers but that vanilla was there in the finish. This one needs time. Fourth was the Merlot, Bernat Despuig. Bright, youthful, that look that young Merlot has, purple and fresh. On the nose really jammy black fruit and quite creamy. In the mouth, the fruit finished with a hint of bitterness, one of the problems with Mediterranean Merlot. Finally the Tempranillo, Guillem D´Eris won the Silver medal in the Wines to lay down category. Nice deep garnet colour, bright at the edge and on the nose very clearly Tempranillo, fresh and young. In the mouth well structured, good body, creaminess from the crianza, round , elegant and a long finish. I am looking forward to seeing this bodega progress. It was Rodrigo Vera Landete the Commercial Director who was telling me about the revival of Vino Carlon. Until Phylloxera struck and ruined everything in Castellon´s wine-producing areas, Vino Carlon, made from Garnacha Tintorera was probably the biggest wine export from the area. Exports were high throughout the 18th and early 19th century but the wine was known from the 15th century with purchase s recorded in the UK and Northern Europe. .
Now a small group of growers have got together, replanted some 10 hectares of the variety aiming to take a maximum harvest of 10k kilos or about 30k bottles annually, the first of which should be ready in about five years time….doesn´t seem too long to wait! We turned to last years new arrival Jose Luis Sanchez of Benlloch. He also has a new Sauvignon Blanc, an incredibly fresh and fruity wine with massive fruit and a long finish. This is a wine which will be making an early entry into the cellar here just as soon as it is bottled and labelled! He also has an easy drinking Tempranillo based red with a label aimed at the young and called Torito which will be pushed out next month in the Fiesta of the Magdalena in Castelló. I hope there is some left afterwards it is a fun, easy drinking red and one that will fit in very well here! 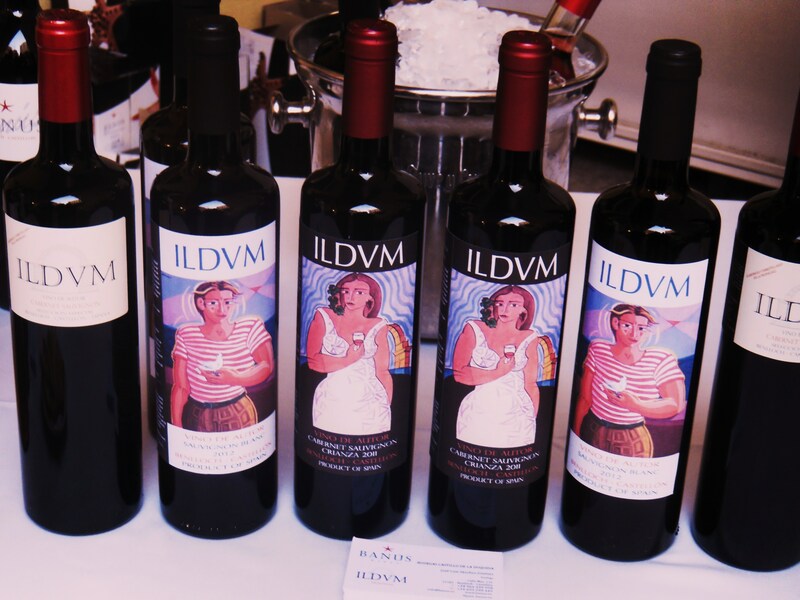 Jose Luis has also had some re-design work on some of his labels, the result of a years worth of marketing experience. Whist the Alvaro Gil and Ildum ranges sell well , there is customer resistance to some of the traditional labels used. We will see if Castellon´s most famous artist can improve sales with these sassy designs pictured here! 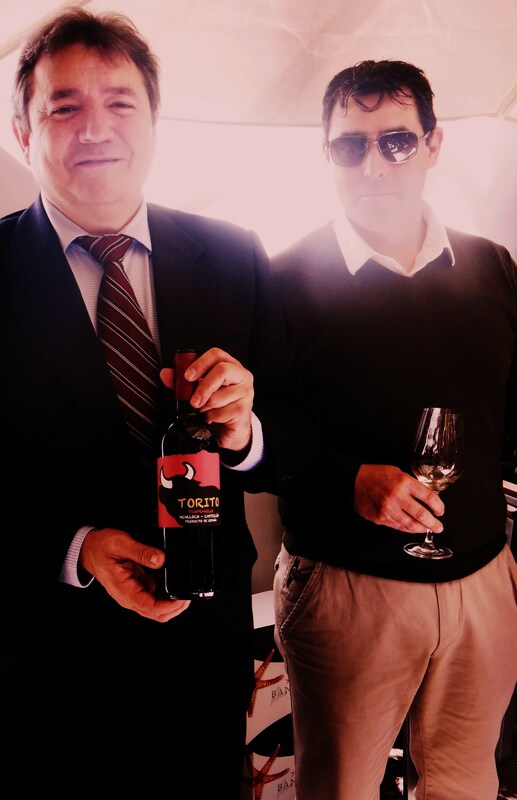 Jose Luis sanchez with `Torito´ ! No visit to this fair is complete without a visit to VinyaNatur´s stand with Estevan Martin Navarro and wine-maker Eloy Haya Rebolledo…..a glass of Barranc D´Infern and a chat about new projects. Eloy was telling me about his new project with Bodega Picos in Zaragoza. And we got to catch up with Vicente Flors of Clotas fame. As we enjoyed the certificates awarded, especially for the Clotas M, his Monastrell which we have been waiting for since 2010 he dropped the bombshell that his remaining stock may all be heading stateside! This is a wonderful Monastrell with 14 months oak, full of laurel, balsamic, floral (violets) and about the only wine from this variety I would pay 15 € a bottle for! Only 3000 bottles were produced and there are only 2500 of the 2011 which has yet to be released. There were Ismael Sanjuan from Bodegas Sanjuan, with his bright labels, El Mollet with Roques Negros who we first met in Benlloch last year, Masia de la Hoya and Mas de Rander to name just a few more. The future of winemaking in Castellon looks very bright. There was not one bad wine on show and the number of awards and the winners reflected well the increasing range and quality of emerging wines clearly showed never mind the financial investment being made. Castellon wines will keep us all busy this year! 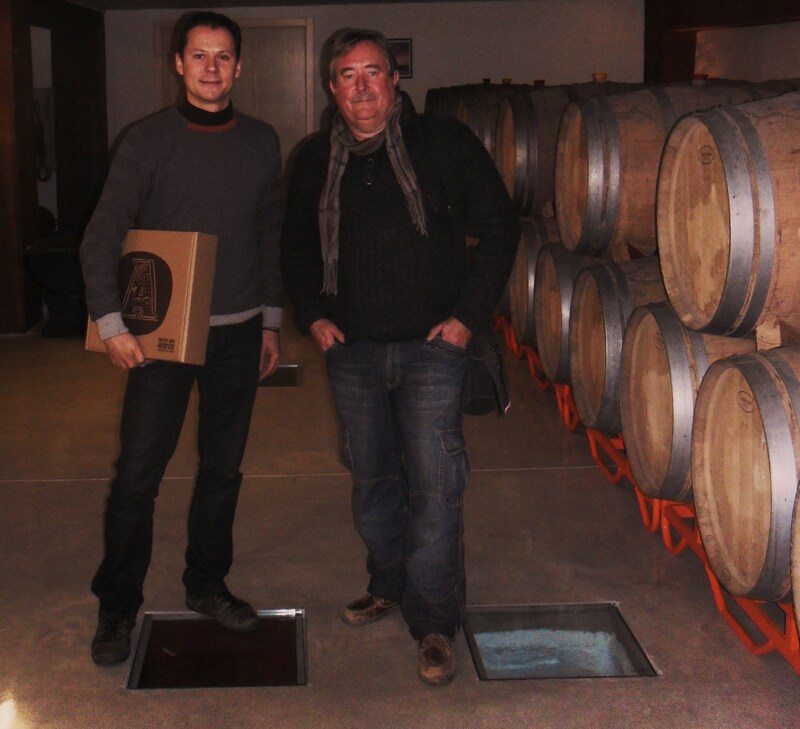 A Visit to Bodega Antonio Arraéz – Modern Philosophy and a Long Tradition of Exporting. 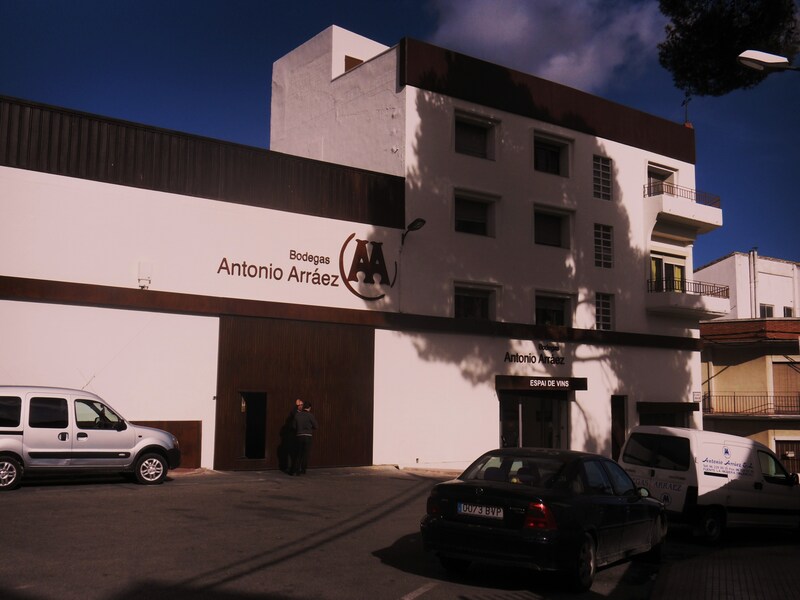 The family bodega of Antonio Arraéz in La Font de la Figuera, DO Valencia, is now in its third generation. But its history as a bodega goes back long before the 1950´s when Antonio´s grandfather, also Antonio, commenced the process of buying out his neighbours. The bodega was originally three or four private bodegas which were situated next door to each other and which now have been combined. When Antonio ( Toni) – a graduate of the Requena wine school – started working for the bodega his father ( also Antonio) was in charge. Under his grandfather the bodega had offices in Xativa from which the business was run. Under his father bottling of wines started ( one of the first in Valencia to do so) and in 1985 was actually the biggest exporter of wines in DO Valencia, dropping to fourth after Baronia de Turis, Gandia, and Schenck by 1998. His grandfather was responsible for selling in bulk, and this was the hay-day of visitors turning up with their bidons to buy their daily wine. Under his father the neighbours continued to buy but the overseas marketing traversed into bottled products, which under Toni continues apace with the addition of bag-in-box wine as well. Today the bodega sells to some 25 countries in Europe, (the UK, Denmark, Germany, Russia amongst them), to Asia ( including Japan, China, the Philippines) to Africa ( including the Ivory Coast ). During my visit an order for the traditional wine `Don Leon´with its special label was being bottled for Russia. In the New Entrance Hall. These foreign sales underpin the expansion and modernisation of the bodega itself. Toni is carrying on the tradition of change and up-dating. Until the last couple of years the old concrete deposits have been used but these are not suitable for Toni´s vision of the wines he wants to make. So the bodega has undergone a transformation to turn it into a modern participant in the new `Terres de Alforins´wine route as well as aiding in the education of new wine-drinkers. 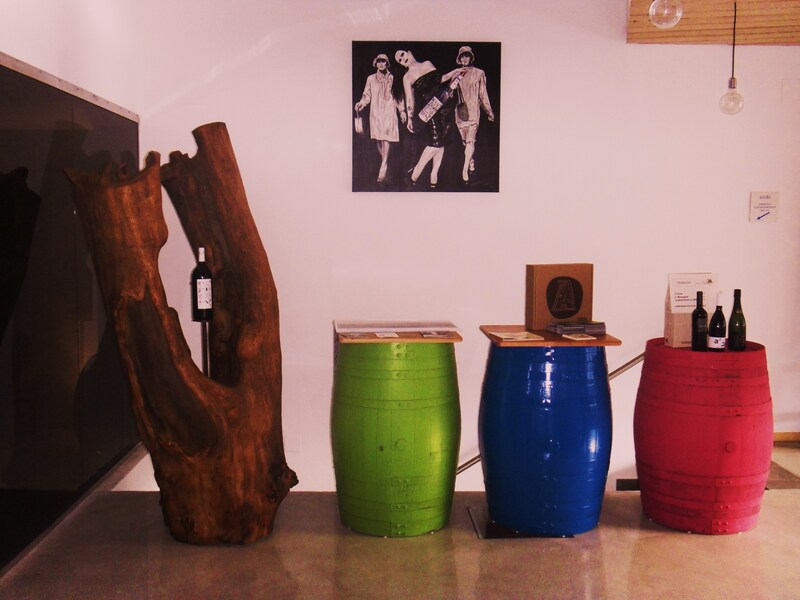 The bodega now enjoys a developing wine-experience for visitors. A trip down into the cellars is in fact a walk through the old deposits, knocked through, with each containing part of an exhibition which covers the history since the 1950´s with artefacts from each of the Antonio´s periods of control. 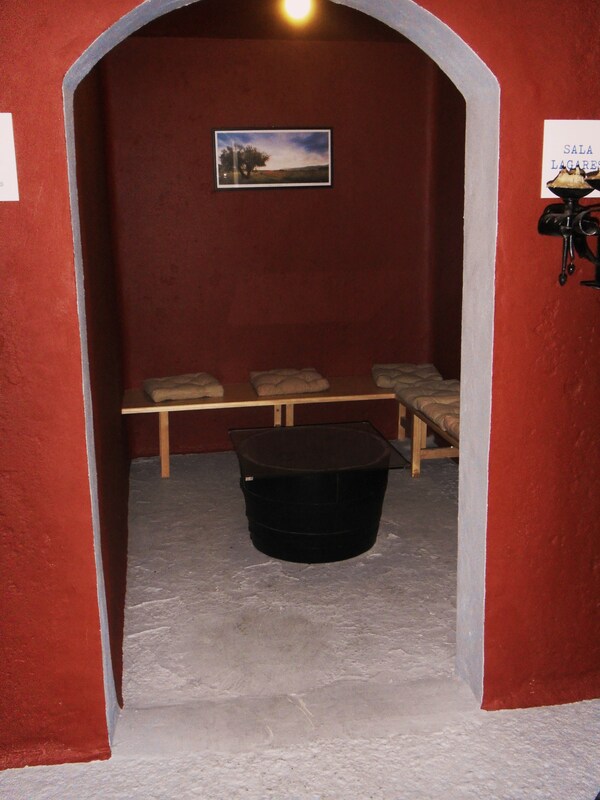 In another of the `trullos´( former deposits) visitors can take a bottle from the shop upstairs, open it and drink it in a quiet space and there is a larger room where at the weekend when the equipment is working, bigger groups can be accommodated. There is also an art-gallery ( currently exhibiting `Palindroms´). `Trullo´ Opened up to Enjoy Wine. 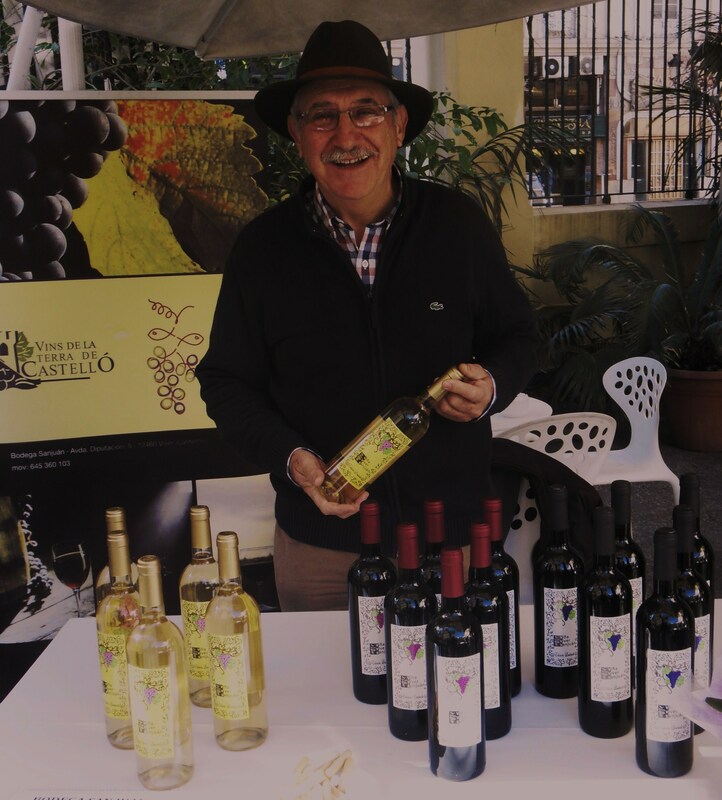 Art is a favourite of Toni´s being one example of culture, like wine, and he is happy to link his new wines, particularly the Mala Vida Tinto with cultural events. Upstairs the bodega has a large warehouse where stainless steel deposits sit cheek by jowl with palettes of wines waiting to be delivered and bottles waiting to be filled! There is also a new area with deposits and separately a bottling line with the biggest selection of rolls of labels I have ever seen. This is part of Toni´s ongoing problem, combining four bodegas into one is not easy with differing floor levels etc, and indeed the bodega is not really big enough for the production. Toni already has to borrow space for fermentation and barrels from other local bodegas. However he is clearly not put off by the problems. The seven-year plan for the bodega has seen the target for year five reached after just three years and the whole project should be complete in another two….two years ahead of schedule! Toni´s team is also modern its outlook. Each employee now undergoes training in a specialism so that the office staff are IT literate and speak foreign languages, the warehouse-man is an expert in his field and in security issues etc. In this way everyone contributes to the development of the bodega. Bottling for Export to Russia. Perhaps the biggest change however has been in the wines. 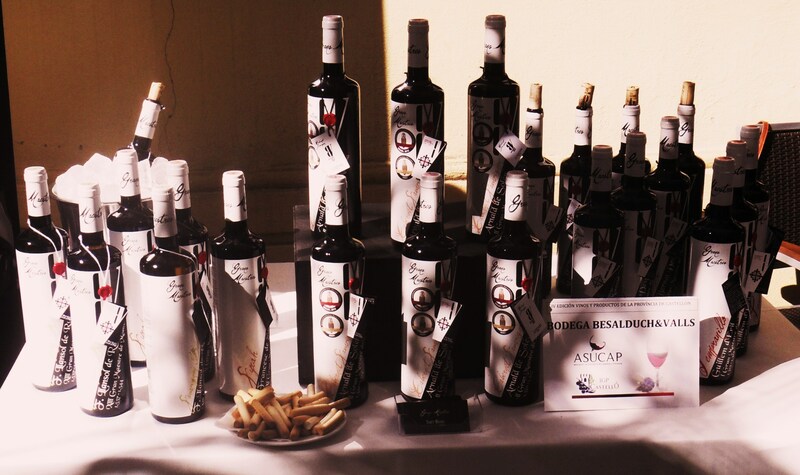 The vino de mesas are still sold, El Ramblar and Don Leon. The Casas de Herencia from the `traditional´ range was in evidence in the shop along with a Moscatel but the bodega today is best known in Valencia for the new wines. 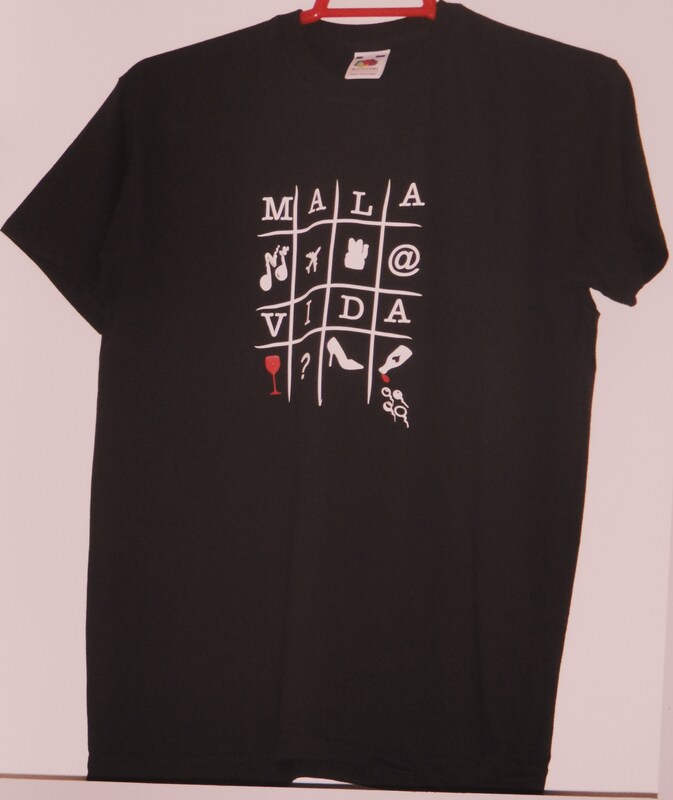 Mala Vida, a tinto even has its own Facebook page. The wine´s label is catchy with its youthful themes of new technology, travel, music etc it appeals to younger drinkers where Toni believes the future lies. A blend of Cabernet Sauvignon , Syrah and Monastrell and eight months crianza in French and American oak it is a very easy drinker, a fun wine. New wines may well join this range. A2 is named after the two Antonio´s, father and son. 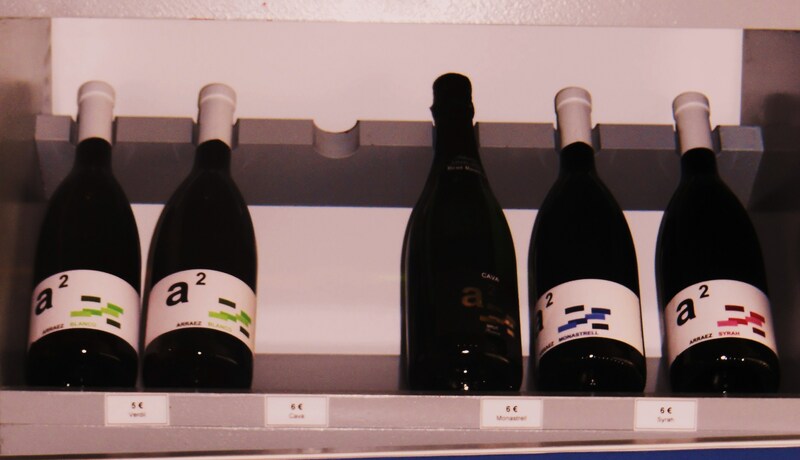 The range includes four wines first of which is a cava (made for them at UVÉ in Requena as the bodega is well outside the DO). Around 80% Macabeo and 20% Chardonnay it is a wine for aperitifs but can be drunk throughout the meal. The white is a blend of 80% Verdil with the balance being a Moscatel and Malvasia. The result is a fresh wine, with hints of white flowers, acacia, lilac and orange blossom. In the mouth it is full, unctuous even, but has a perfect balancing acidity with good fruit flavours. There is also a syrah, cherry red, with thick legs. On the nose, fruity, strawberries and blackcurrant and in the mouth smooth, good body, round, well-balanced with a long jammy finish. The second A2 red is Monastrell, the local red variety. Also a deep black cherry with long legs, on the nose black fruits, with chocolate and oak. In the mouth very full, very fruity, balanced with a full and very full finish of black fruit. Newer is the Lagares range. Two wines currently are produced. The first is a crianza 2009, 100% Cabernet Sauvignon and takes its name from the old tank in which grapes were trodden. It has had thirteen months in French and American Oak. The second is a reserva from 2007, a blend of Cabernet Sauvignon, Monastrell and Syrah with 17 months in oak and 20 months in the bottle. The bodega also have a pair of wines named for the painter Eduardo Bermejo, wines which are a collaboration between Toni, Eduardo and Pedro Calabuig of Pequeñas Bodegas de Levante who export it. The white is a 2011, blend of Moscatel and other varieties. The red is a Tempranillo 2010 Barrica. I am looking forward to tasting these four wines very soon! Finally Toni has produced a white from Monastrell which was premiered at the Noche del Vino in mid-June in the Botanic gardens in Valencia. Not only has this wine won the Els Bodeguers tasting but it, and most of Toni´s other wines are highly rated with points in the early nineties in the Guia Penin. The bodega has some new lines to introduce, a new web-site is being designed and the logo is being changed. None of which I suspect will detract from this excellent bodegas progress and quality wines. Definitely one to watch! With Toni in the Cellars.